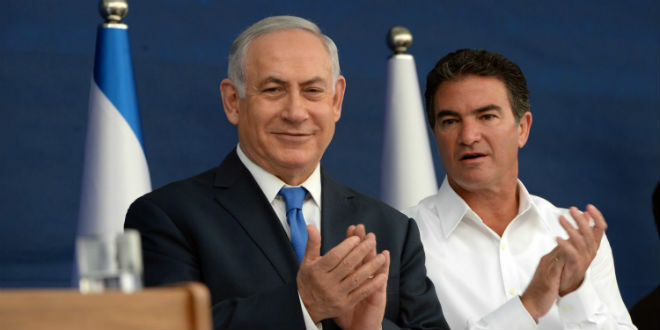 (Israel Hayom/Exclusive to JNS.org) Israel’s top priority is dealing with the threat posed by Iran, the head of the Israeli Mossad, Yossi Cohen, said Monday at a ceremony in which the intelligence organization received the prime minister’s citation for operational achievements. Israeli Prime Minister Benjamin Netanyahu (left) with Mossad intelligence agency chief Yossi Cohen Monday. Credit: Haim Zach/GPO. Cohen detailed the dangers emanating from Iran, saying the country is seeking nuclear capabilities for military purposes, aggressively directing military and operational forces close to Israel’s borders with Syria and Lebanon, and increasingly supporting the Palestinian terror group Hamas. The Mossad director also touted the intelligence agency’s achievements, saying the organization conducts countless operations—some exceedingly complex and bold—in the heart of enemy countries.